I was wrong! 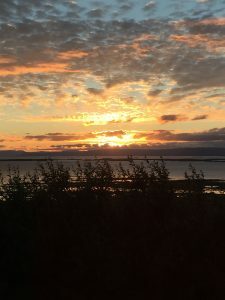 You know, this bit from Part 3: “But if you are after a fast, busy, techno holiday with smoke and bubbles – Iceland is not for you.” I wrote that after circumnavigating most of Iceland, but I hadn’t arrived in Reykjavik. 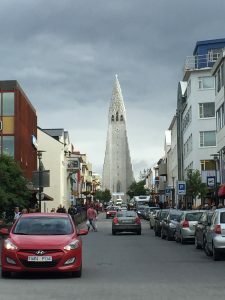 And two thirds of Icelanders live in Reykjavik! And in summer they never sleep! After leaving heavenly Skalanes, we headed south. The roads become wider and there were noticeably more people and tourist buses on the move. 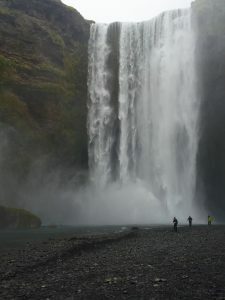 At our accommodation near Skogafoss, another beautiful waterfall, a local informed me that Iceland tourism has been growing 20% per year over the last five years, and it is putting tremendous pressure on the infrastructure. In 2017, Iceland is expecting over two million tourists . Not only is that a new record but that is a heck of a lot of people for a tiny country of around 330,000 people. The south is beautiful. 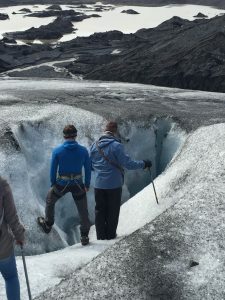 Walking on the Vatna Glacier, Iceland’s largest ice cap, with its eerie stillness and black, white and blue colourings, felt like I had been transported into the fantasy realm of Narnia. 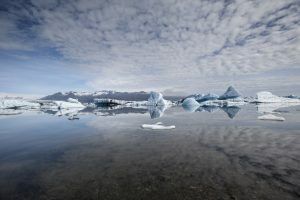 I could have spent hours staring at Iceland’s most visited tourist destination: the Jökulsárlón Glacier Lagoon. 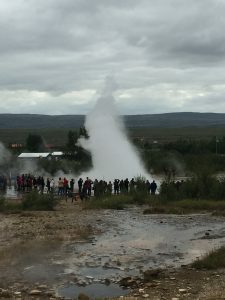 We took time to visit Geysir (meaning gusher), with its spectacular geothermal pools and diva of a geyser, after which all other geysers are named. All history and geology buffs should visit Thingvellir. 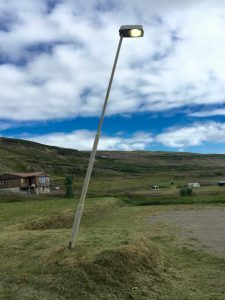 So much of Icelandic history and identity was shaped here. It is also the meeting place of the North American and Euroasian tectonic plates. 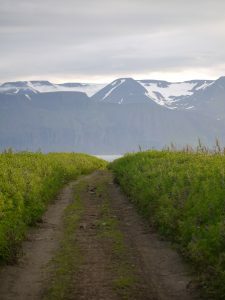 I walked through the middle of the rift and marvelled at the wonder of our world. Our last few days have been spent in the island’s capital, Reykjavik. We arrived in time for the Annual Jazz festival and settled ourselves in a little apartment in the middle of the city. Our stay co-incided with a weekend, and it feels like the whole city centre has become a giant street party that really only gets going after midnight. Icelanders don’t settle down in one pub for the night, they crawl from one to the next, getting progressively louder as they do. I am very in love with my industrial ear plugs right now! The time has come to pack and take the long journey home. Iceland has been a blast and I am so very grateful to have shared the time with my most favourite human and partner-in-crime of 30 years. I highly recommend this part of the planet to all who have a sense of adventure and wanderlust. 1. Book your accommodation ahead of time. In summer this tiny island takes a tourist beating. Don’t expect to book last minute. Even with my partner’s careful planning, there were some areas that were nearly booked out … and that was months ago. 2. Alcohol is very expensive here. If you enjoy a glass of red, I suggest you buy a bottle at the government run ‘Vinbudin’. The restaurant prices are ridinkulous! 3. You can save money on meals by ensuring that your accommodation includes breakfast. Also, many of the small supermarkets around the country have delicious fresh sandwiches for sale. These made up most of our lunches. Find out where the locals go out to dinner and eat there. Many of the highlighted restaurants are simply run for the large tourist buses that roll in. 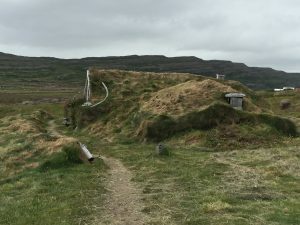 Here ends my Icelandic iPhone travel rambles. Wherever your travels take you, pilgrim, may you feel humbled at the grandeur of the planet we call home. 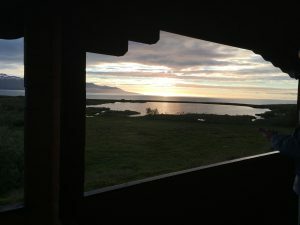 After a couple of days up north in Husavik, we headed east to the Skandales Mountain Lodge. Taking a detour, we stopped at the Vatnajökull National Park, Europe’s largest protected reserve. You could spend weeks here. 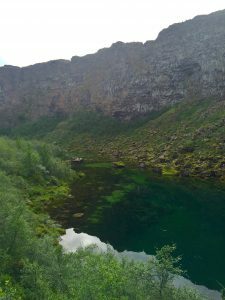 We just had time to walk down to the gorge at Ásbyrgi and marvel at the vertical canyon walls. 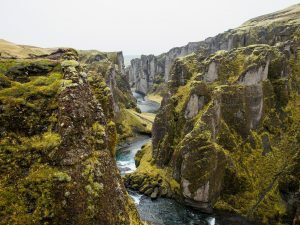 It seems that in Iceland, Mother Nature got totally carried away and threw some of her world’s most gobstopping spectacles on one tiny island. Dettifoss Falls was the next stop. At 100 metres wide and with a 44 metre fall it is Europe’s most powerful waterfall. 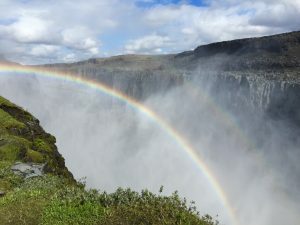 It is spectacular with a permanent giant rainbow as its crown. Thundering at such voluminous speed it sends up a permanent spray that can be seen for over a kilometre away. Do take care on the walkways, they can be very slippery. We then headed to Seyðisfjörður. 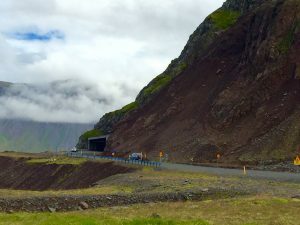 A 27 kilometre road over the Fjarðarheiði mountain connects Seyðisfjörður to the rest of Iceland. If you see one place in East Iceland – let it be this place. 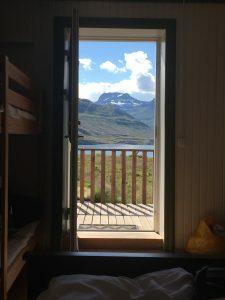 Situated at the very end of a fjord, surrounded by mountains, it is decorated with colourful wooden buildings – the whispers of a past when this place was inhabited by Norwegian fishermen. We drove another 17 kilometres out of town, along a perilous dirt road with three river crossings to arrive at our accommodation – Skandales Mountain Lodge. This is about as remote as you can get – and is probably a visual display centre for what some would call heaven. 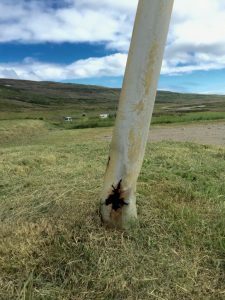 If you ever come here, hike up the mountain – the hike took us about five hours return, we built a stone pillar on the very top … It may still stand there to applaud your effort when you arrive. One, the roads in Iceland vary. The main Ring road (1) that circles around the island is mainly asphalt, but on our trip south today there were also sections of gravel and some serious cliffs and turns without any barriers. Although roads are well built, they are narrow and elevated in order to handle snow and flood. You cannot become complacent on these roads. If you feel uncertain about driving here, or driving on the right side of the road, please consider a bus tour. It will be far more relaxing. 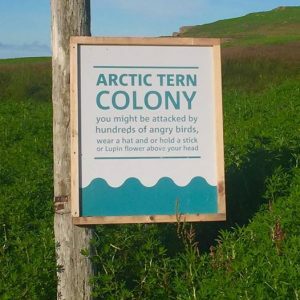 And you probably won’t come to a screeching halt like we did when we spotted three reindeer casually strolling along the black coastal shores! Two, Icelanders are hospitable, warm and informal. You feel very safe and welcome in this beautiful country of theirs. I hope that the increasing tourism treats them well so that the delightful innocence, that is part of this place like the fresh air, continues. Three, Iceland is made for those who love nature and outdoors. It is a nirvana for any artist. It’s rich history and sagas will keep you enraptured as you travel to the different places. But if you are after a fast, busy, techno holiday with smoke and bubbles – Iceland is not for you. We spent a couple of days in Nyp, exploring the stunning Snaefellsness Peninsular and the Strandir Coast in the Westfjords. Then it was time to head north to our next destination – the quaint little seaside town of Husavik, famous for its whale watching expeditions. We took a scenic detour on the way Husavik. This included some interesting F roads. Yes, F roads! And they really are F roads. F stands for ‘fjall’, which means ‘mountain’. And these F roads are only for 4WDs. Please, believe me, you need a decent 4WD to go off the beaten track. 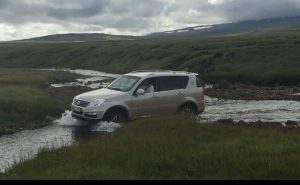 We crossed many rivers, which was a huge amount of fun, but they would be real F roads with any other vehicle! And let’s just talk about those tunnels. Seriously, Iceland, how to scare the BarJebus out of your tourists. Some tunnels are one lane, very dark, and it feels like you are playing chicken with the oncoming set of headlights. One side of the tunnel has tiny turnout areas that the car travelling in that direction has to pull into in order to let the other one pass. It’s enough to get the adrenalin pumping … Personally, I think they should be called F Tunnels. Look out for them! Ok, whale watching – you have to go whale watching. 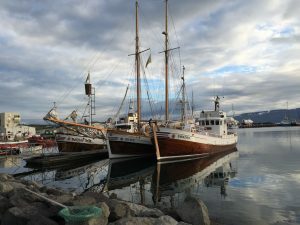 We chose one of the original, old fishing boats, now converted into a magnificent sailing ship, to take the 4 hour journey, and it was so worth it. We saw humpback whales breaching across the glassy surface, smaller minke whales darting in front of the ship, and Puffins … Thousands of those comical looking birds with their bright orange beaks and feet. For people like myself, who prefer these magnificent whales in the water, instead of on a menu at some restaurant to feed the face of an overfed tourist, check out the web (http://icewhale.is/whale-friendly-restaurants/) or download an app to support whale friendly restaurants. With all the food available to feed our robust bodies, please avoid eating whale. 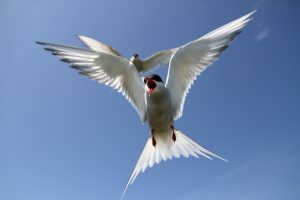 Avoid eating puffins too. In fact, it’s a great idea to become mindful of what we stuff into our mouths at anytime and the price paid for our indulgences. One, is to invest in the Lonely Planet’s book on Iceland. This was a gift from one of our sons, and we have used it every day. 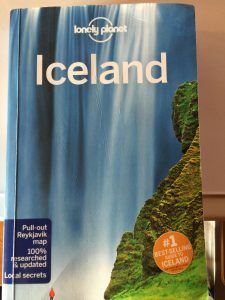 It is jam packed with very helpful information on nearly every area in Iceland. Two, Iceland is expensive. We have planned this trip, which marks the momentous occasion of 30 years of marriage and my 50 years on planet earth, for quite some time. 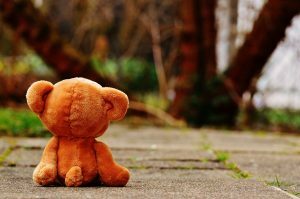 This is not one of those holidays that you take spontaneously and hope for the best. It is cold here – so you need to sleep somewhere warm. You will also need to eat (remember, no whale!) – accommodation and food is expensive. 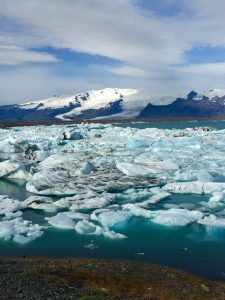 So plan and save for your Iceland holiday. Our trip through Iceland began a couple of days ago. Touching down at Keflavik Airport, approximately 48 kilometres outside the capital of Reykjavik, we picked up our rental car and started on our 3 1/2 hour journey to Nyp – our first destination point. It took a few moments to adjust the brain to driving on the right side, or the wrong side, of the road. This was followed by a minor panic attack as the GPS froze over. Then there was the major decision about how hot we wanted the car and then … well, then it hit me. I am in the land that inspired Tolkien. It didn’t take long to see why. The sun was shining as we wound our way through a landscape like nothing I have ever seen before. It is like the moon, the Scottish Highlands, Norway, New Zealand and Mad Max all decided to make this their common room! 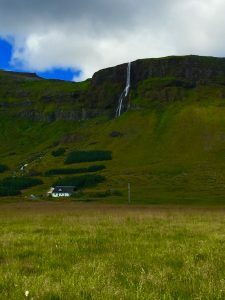 There are waterfalls cascading over grey rocks and disappearing into green meadows. Glaciers tower over copper coloured mountain peaks playing solitaire on black lava fields. What is this place?! And why has it taken me fifty years to get here? I stop to buy a bottle of water. “May I suggest you don’t buy bottled water? It is a trick. Just use tap water,” says the lady behind the counter. I stare at her, stammer a “thank you”, and walk back out of the shop without a water bottle. 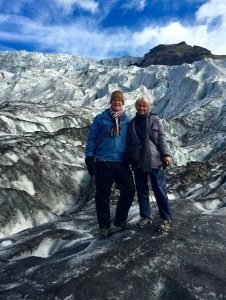 Icelanders, as I had just found out, are fiercely protective of their beautiful environment! Our kind hosts at Guesthouse Nyp make us feel very welcome. Thora, our hostess, serves a breakfast feast that should earn her a Michelin Star. She takes a moment to explain where everything we are eating was sourced from, most of it from her own garden. Then there is the dinner – freshly caught cod, homegrown salad and vegetables. I rave about her meal and indicate I will let people know on TripAdvisor. “Please don’t say a thing,” she says, “otherwise I will be cooking all the time.” I smile to myself. The people here are as honest and as much salt of the earth as the salt they harvest from their seashore. 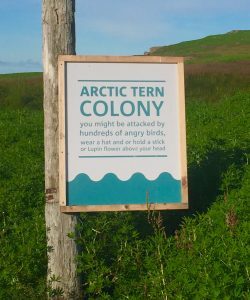 It is summer here, but when those winds blow it is a no brainer about why this place is aptly named ‘Iceland’. So if you are planning a trip, pack warm, layered clothing. Make sure you have water resistant hiking shoes … and purchase some rain pants. O, and read ‘Burial Rites’ by Hannah Kent (more about that book in another post). I will be back with another Iceland instalment in a few days. Iceland! It’s been on the Bucket List for a very long time. In a few weeks, the beloved and I will be travelling to this isolated, under-populated island on top of the world … and I can’t wait! If you are going to travel, my partner-in-crime is your ‘go to’ guy. 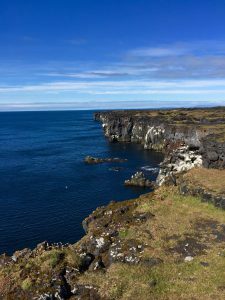 He has meticulously planned our days from the time we arrive in Iceland’s capital, Reykjavik, the world’s northernmost capital city, to the car hire, accommodation, and cash conversion. I do not share his eye for detail or enthusiasm for travel planning. But over the years, and on our many travelling adventures, I can only say how grateful I am to this travel mastermind. 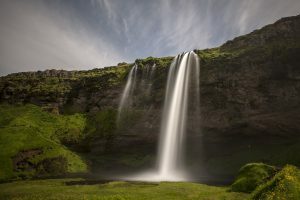 As a devout nature lover, Iceland has always fascinated me. It has a unique landscape, shaped by the forces of nature: geysers, mudpots, ice-covered volcanoes and glaziers. Locals and tourists alike fall in love with its green valleys, fjords and roaring rivers. As I write this, I glance at my hiking boots with great anticipation! Icelanders are obviously very proud of their beautiful piece of the planet. They have gone to great length to preserving their natural wealth through conservation and responsible fisheries management. 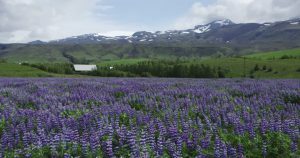 According to the Environmental Performance Index, Iceland is the world’s greenest country. Renewable energy is a major focus and nearly every home in the country is heated from renewable energy sources. I do wish the powers-that-be in my own beautiful habitat would pay attention to reasoning and the actions of these Northerners! Then there are the books! Research shows that more books are written, published and sold per person per year in Iceland than anywhere else in the world. As a young child I was fed a steady diet of bedtime stories from Brothers Grimm, Norse Mythology and Icelandic Sagas. 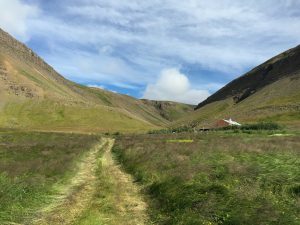 These sagas remain an integral part of Icelander identity. They also contain valuable information and record monumental events, like the discovery of a large island called ‘Vinland’ by Leif Erikson – an island later divided into two and renamed Canada and America! The sagas influence how we tell and read stories to this day … Tolkien would agree. Ég tala ekki íslensku! But not to worry, there are some great apps to help with that problem. And, yes, my travel-wizard partner has already downloaded them. Icelandic is an insular language and has not been greatly influenced by other languages. 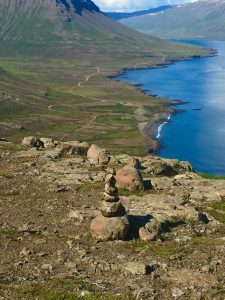 It holds similarities to Norwegian and Faroese, but has changed very little from when the country was settled in the ninth and t enth century. 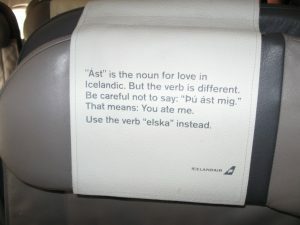 Icelandic is astoundingly difficult to speak and even harder to pronounce. Fortunately, most Icelanders speak English, so I won’t even attempt to demonstrate my zero Icelandic competence … and I won’t tell my enthusiastic travelling companion that we probably won’t use his freshly downloaded apps. Let’s not forget the hot springs. Ingrained in Icelandic culture is the wonderful habit of bathing outdoors in volcanically heated pools – a tradition started by the Vikings. These geo-thermally heated pools, dotted across the country, have valuable health benefits. 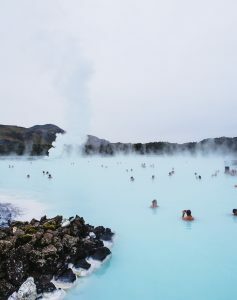 The most famous of these is the Blue Lagoon – in a lava field on the Reykjanes Peninsula. My bathers are packed! If you hear some rumours about an insane Australian who missed her flight home because she found marinating in these pools more appealing than a gruelling plane flight home … that could be true! 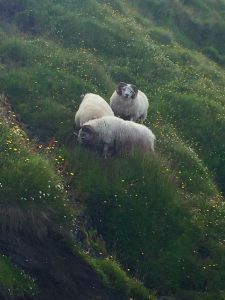 I have a deep and ongoing love of Iceland, particular the landscape, and when writing ‘Burial Rites,’ I was constantly trying to see whether I could distill its extraordinary and ineffable qualities into a kind of poetry.